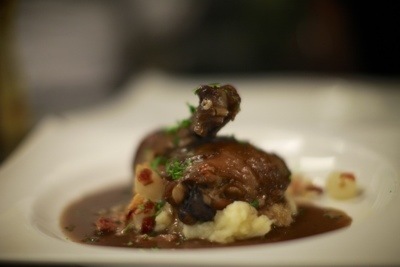 Coq au Vin is another one of those French recipes that never fails to thrill guests. I love serving it especially because you can get it all done in advance and safely let it sit in a warm spot for up to 2 hours; just reheat and serve. No last-minute flurry! 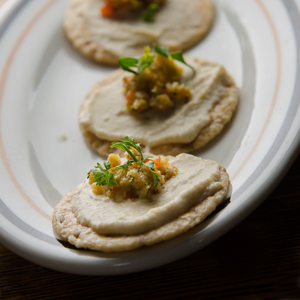 Crackers with Hummus and Tapenade Verte. Beforehand Nibbles: Don’t overdo appetizers! You want to rouse—but not douse—your guest’s appetites before they sit down to savor your masterpiece. I always start simply: Maybe a few of my Tapenade Crackers: Simply slather a great cracker (I love Trader Joe’s Savory Thins) with some purchased hummus and a bit of my Tapenade Noire (page 6 of The Bonne Femme Cookbook) or Tapenade Verte (page 7). Maybe put out a small bowl of nuts or if you can’t help yourself, slice a few thin slices of a wonderful cured sausage (preferably from France). Serve with a classic Kir au Vin Blanc or one of these apéritifs. Why not start with something fresh and bright? Your guests’s appetites are truly revved up after this beauty! 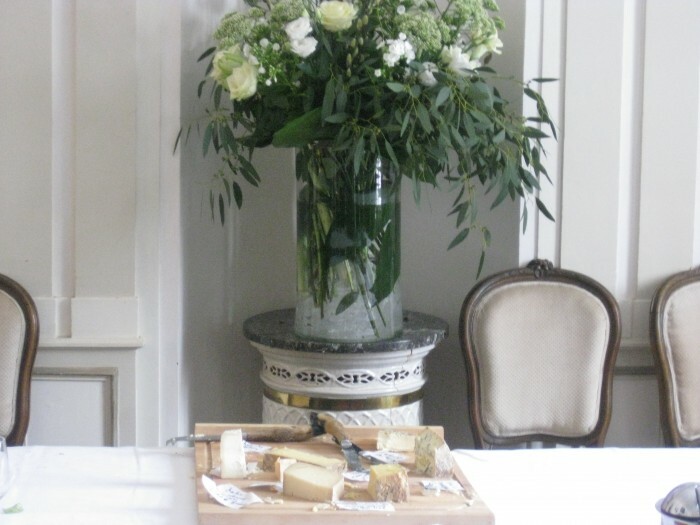 Cheese course simply presented at Domaine des Closel in Savennieres, France. Entirely up to you! 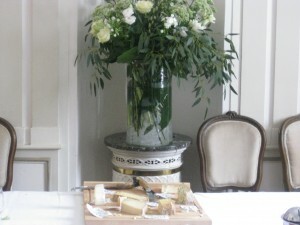 Yes, you’ve had a little cheese in the first course, but not that much, and who says you can’t have more? Just don’t serve blue cheese if you’ve already served blue cheese in your sit-down starter. Ah, the lucky French. They have a great pâtisserie right around the corner. If you do, too, go ahead and pick up a luscious tart perhaps one of those jobbies with pastry cream and fresh fruits that sparkle like jewels. Of course, I have a classic French Fruit Tart in my book (page 354), but if you don’t want anything all that involved, then go for another classic that’s just as beloved but much, much easier: Crème Caramel. You see, nothing in this particular menu has been overly creamy, so a cool, slithery-on-the-tongue crème caramel will finish provide a silky, rich finale that won’t do your guests in. You want them to float out the door feeling great for having eaten chez vous—the last thing you want is for them to go home and groan. Wine Pairing: In my view, unless you want to splurge for a really great bottle of Gevry-Chambertin, a really good Beaujolais Cru is about the best wine in the world to go with this. Read about Beaujolais cru in one of my recent Weekend Posts.